Hi, do you have a turkey costume? This was the preamble to my day as a turkey. I thought I’d get my money’s worth by wearing it all day at work, seeming that we had our departmental Thanksgiving luncheon that same day. I figured it would be like the time I showed up to a friend’s baby shower in a maternity dress stuffed with pillows and claiming that the party was indeed in my honor. So, the next morning I waddled into work in full beakage and observed as coworkers gasped in a mix of surprise, confusion, joy and more confusion. I kept a detailed journal of the comments made to me throughout the day, hoping it would expand my understanding of the human condition and maybe a little insight into the appeal of furry-ism. Why are you dressed like a chicken? Are you going to eat yourself? I’m really not a turkey. Are we doing business with Chick-Fil-A? Oh, a turkey! I thought you were an Angry Bird. I’m an Angry Turkey, actually. Is there an event happening today? It’s Hallow-giving. It’s the day people dress up as turkeys and ask for candy. Haven’t you heard of it? 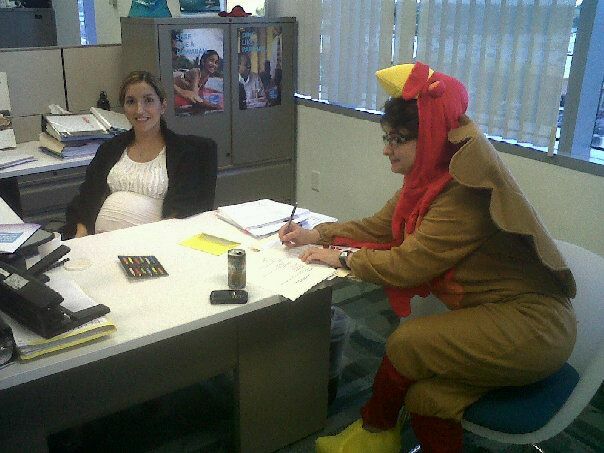 Really, tell me, why are you dressed like a turkey? Lots of departments are having their Thanksgiving pot-luck luncheons, and this is the best way to get invited to all of them. 1. Generally, people enjoy costumes. But Furry Fandom is still weird. 2. Human beings need to know the “why” of absurd things. 3. The more you don’t explain something, the more they want to know. 4. People will take anything as an answer – as long as you answer. After a day of social experimenting at the office, I was ready to let loose on the softball field. Team, please be advised that due to lack of player this evening we will not be playing. The game is going to be forfeited on our part. I apologize, however these things happen as people have schedules and unexpected circumstances. There was a furry meet-up on the same night as our softball game. Apparently, my teammates are a bunch of fur-verts and I’m the turkey that didn’t catch on.